Explosives are chemical substances which, when suitably initiated, undergo a rapid release of chemical energy that converts the explosive into hot gas under extreme pressure. These explosive residues can drive a projectile or shatter nearby objects through their shock effect. Explosives have been an important part of warfare since gunpowder was introduced into renaissance Europe, and they reached a high degree of sophistication during the Second World War. Explosives can be broken down into two broad categories. Low explosives, often referred to as propellants, are combustible chemical mixtures such as gunpowder or nitrocellulose. They do not usually produce a shock effect unless ignited in a confined space. The burning region of the propellant spreads through heat conduction at less than the speed of sound. In technical language, the burn front is a subsonic deflagration front. The relatively gentle combustion of propellants makes them ideal for driving projectiles, such as bullets, shells, or rockets, and this had become their chief military function by the time of the Second World War. The first propellant was black powder, a mixture of potassium nitrate, carbon, and sulfur. Black powder had long been abandoned by the time of the Pacific War in favor of propellants that burned more slowly and steadily, were much more powerful, and produced much less smoke. Propellants based on nitrocellulose were known as single base propellants, while those that combined nitrocellulose and nitroglycerine were known as double base propellants. Triple base propellant added nitroguanidine to the mixture, which reduced the flame temperature without reducing chamber pressure, improving barrel life and reducing the visible flash produced by the propellant. Diphenylamine was often added as a stabilizer, while potassium sulfate or similar compounds were sometimes added to reduce flash. The propellant was shaped into grains or tubes of uniform size, and these were sometimes coated with dinitrotoluene to reduce the initial burn rate and graphite to reduce the buildup of static electricity. Propellants for the largest guns were manufactured as sticks, up to an inch in diameter and two inches long (2.5cm by 5cm), and each stick had a number of lengthwise holes. As the propellant stick burned, the holes increased in diameter, thereby increasing the surface area and burn rate of the propellant. Thus, the burn rate was initially relatively low, then increased as the projectile was pushed down the barrel. This ensured that the gas pressure behind the projectile remained close to the design limit of the barrel much longer than would otherwise be the case. Propellants for smaller guns were manufactured as correspondingly smaller sticks or grains, sometimes with central perforations or as tubes to produce the same delayed peak burn rate. The American Army and Navy relied on single base propellants when war broke out. Almost all small arms and cannon of up to 20mm caliber used IMR (Improved Modern Rifle) powder, which was a nitrocellulose-based propellant with small amounts of potassium sulfate and diphenylamine and a coating of dinitrotoluene and graphite. Larger Army guns used NH (Nonhygroscopic) or FNH (Flashless Nonhygroscopic) powder, which were also composed of nitrocellulose and dinitrotoluene. Naval guns used SPD, a propellant composed of 99.5% nitrocellulose and 0.5% diphenylamine, which was prized for its stability. The U.S. Navy credited the survival of Boise and Savannah after being hit in their magazines to the use of SPD. SPD also was unusually smoke-free even for a "smokeless" powder, which had obvious advantages for daylight gunnery duels. However, very low-smoke propellants had a decided tendency to produce a bright flash. SPD was no exception, and by the end of 1942 the Navy had issued a requirement for a flashless propellant. Given the large stores of smokeless powder already in existence, the Navy desired the new propellant to be remanufactured from existing powder, and considerable effort was made to avoid the use of nitroglycerine, towards which the Navy had an almost visceral distrust. The result was Albanite, which was a mixture of 55% nitroguanidine, 20% nitrocellulose, 19.5% DINA (bisnitroxyethylnitrate), 4% dibutyl phthalate, 1.5% centralite (diethyldiphenylurea) , and a variable amount of potassium sulfate. However, mass production of Albanite did not begin before the war ended, and the Navy ordered large quantities of Cordite-N from Canada in 1944 as a temporary measure. 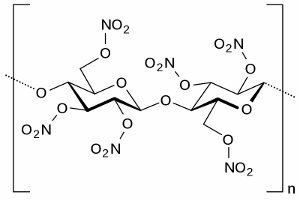 Cordite N was 55% nitroguanidine, 18.7% nitroglycerine, 19% nitrocellulose, and 7.3% centralite, with a variable amount of potassium sulfate. The large amount of inert nitrogen produced by nitroguanidine helped cool the propellant gases and thus reduce the visible flash. The British began the war with Cordite, a double base powder composed of 65% nitrocellulose, 30% nitroglycerine, and 5% petroleum jelly. It was widely used in small arms. However, cordite was notoriously unstable and its performance was highly temperature-sensitive. The Royal Navy had therefore switched to SC, an improved form of cordite composed of 49.5% nitrocellulose, 41.5% nitroglycerine, and 9% centralite as a stabilizer. The chief drawback of SC was that it produced an extremely bright flash due to residual calcium from the lime used to neutralize traces of acid in the propellant (which was essential to giving it acceptable stability.) The British therefore introduced triple-base powders such as NF, which was composed of 55% nitroguanidine, 21% nitroglycerine, 6.5% nitrocellulose, 7.5% centralite, and 0.3% cryolite. The chief drawback of this explosive was that it was difficult to manufacture, requiring large amounts of electrical power for production of the nitroguanidine. Thus all manufacture took place near Niagara Falls in Canada, and supplies had to be strictly rationed. Use of the similar Cordite-N propellant in British service was restricted mostly to aircraft guns. The Japanese Navy relied on double base propellants for naval guns. The C (Cordite) series were typically composed of about 65% nitrocellulose and 30% nitroglycerine with 5% petroleum jelly and stabilizers. The DC (German Cordite) series included about 5% centralite and, in later versions, 2% to 3% ortho tolyl urethane, which was considered an improvement on centralite. The Japanese put considerable emphasis on night combat, and so had developed very low-flash propellants by adding hydrocellulose and potassium sulphate (up to 8% each). This required the Japanese to accept increased smoke and and a 30% reduction in propulsive power. Nitrocellulose was manufactured by treating a source of cellulose, such as cotton or wood pulp, with a mixture of hot nitric and sulfuric acids. The sulfuric acid catalyzed the reaction of the nitric acid with the cellulose. Nitroglycerin was produced from glycerin (glycerol) extracted from animal or vegetable fat and treated with a mixture of hot nitric and sulfuric acids in a process similar to that for nitrocellulose. 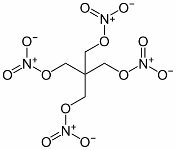 Nitroguanidine was manufactured by combining calcium cyanamide with ammonium nitrate, then treating the resulting guanidinium nitrate with sulfuric acid. The calcium cyanamide was produced from lime, coke, and nitrogen in an electric arc furnace, a process requiring very large amounts of electrical power. Thus, the starting raw materials for propellant manufacture were timber or cotton, sulfur, animal or vegetable fats, limestone, coal, and large amounts of energy. These were available in reasonable quantities to all the major powers that fought in the Pacific. High explosives are chemicals or chemical mixtures that burn so rapidly that the burning region spreads as a shock wave moving at supersonic speeds. In technical language, the burn front is a supersonic detonation front. High explosives produce a shock effect even when unconfined, although a confined explosion is usually more powerful. The plane flew right into the flight deck just a few feet forward of the after elevator.... Shrapnel sprayed among the aircraft and men in the hangar bay, some of it tearing open depth bombs that were waiting to be loaded on planes. High-explosive material poured out of these gutted weapons but fortunately burned without exploding. These so-called insensitive explosives are relatively safe to handle and are preferred for the bulk of the explosive charge in munitions. They must be initiated using a small quantity of more sensitive explosive that can be set off by heat or impact. Their insensitivity comes at some cost in explosive power, and the author has heard at least one explosives expert joke that "IE" stands for "imitation explosive". At the start of the Pacific War, high explosives were dominated by two families of chemicals. Aliphatic explosives, of which the most important was nitroglycerin, were produced from polyols (such as the glycerol used for nitroglycerin) which were treated with a mixture of hot nitric and sulfuric acids. Pure nitroglycerin is a powerful but extremely unstable explosive liquid, which can be stabilized by absorbing the liquid into various inert substances such as wood pulp or diatomaceous earth. The resulting product, dynamite, was widely used in civil engineering but saw little use in munitions, due it its instability under extreme environmental conditions. Aromatic explosives are a large family of benzene derivatives. Of these, the most important was trinitrotoluene or TNT, which is an excellent, inexpensive explosive. It was the first truly insensitive explosive, and it melts well below its detonation temperature. This makes TNT ideal for explosive castings, by itself or as a mixture with other explosives. Cast TNT is so insensitive that it will rarely detonate even when struck with a bullet. TNT is produced by treating toluene, distilled from coal in coking ovens or from petroleum, with the usual hot mixture of nitric and sulfuric acids. TNT contains insufficient oxygen to fully oxidize the carbon in the compound when it is detonated. As a result, TNT explosions produce a smoky black fireball. Amatol is a mixture of TNT with ammonium nitrate that adds enough oxygen to fully oxidize the carbon in the TNT, yielding an explosive mixture that does not produce black smoke and is also less expensive to produce. It was widely used in both world wars. Baratol, which uses barium nitrate in place of ammonium nitrate, was used in the standard British Mills hand grenade. Minol is a powerful but somewhat sensitive mixture of TNT, ammonium nitrate, and powdered aluminum that was used in naval mines. Picric acid (trinitrophenol) is another aromatic explosive closely related to TNT. It was the chief ingredient of Shellite, which was widely used in British naval munitions, and Lyddite, a mixture with guncotton used in some grenades. However, picric acid is toxic, and it has a nasty habit of slowly corroding any metal it is in contact with to produce extremely sensitive metal picrates. As a result, older munitions containing picric acid could be very unsafe to handle. Ammonium picrate (Explosive D or dunnite) is much less sensitive than picric acid, is not as corrosive, and was extensively used in U.S. Navy munitions. RDX (Cyclonite) is an explosive with chemical characteristics intermediate between those of aromatic and aliphatic explosives. It went into mass production just as war broke out in Europe. It is very insensitive and significantly more powerful than TNT but somewhat more expensive to manufacture, using ammonia and methanol as its starting materials. It was widely used as a mixture with TNT known as Composition B, and with plasticizers to form the Composition C family of plastic explosives. It was also used in Torpex, a mixture of RDX, TNT, and powdered aluminum whose explosive characteristics were ideal for use in mines and torpedoes. The aluminum increased the duration of the explosive pulse, making it more effective for underwater explosions. PETN is a very powerful but somewhat sensitive aliphatic explosive, suitable as a booster for initiating less sensitive explosives. It was also used in light antiaircraft shells as a mixture with TNT (Pentolite) that greatly reduced its sensitivity. It could also be desensitized by mixing it with a small percentage of wax, and in this form it was used in primacord. It was produced by nitration of pentaerythritol, which in turn was produced from formaldehyde and acetylene. These were produced from coal, limestone, and electrical power. Trinitroaniline (Picramide) was used by the Japanese in naval shells. It is an aromatic explosive similar to TNT. The Japanese also used picric acid in naval shells and PETN or a mixture of TNT and powdered aluminum in light antiaircraft shells. Japanese torpedoes used Type 97 explosive, a mixture of 60% TNT and 40% hexanitrodiphenylamine pioneered by the German navy in 1907 that was highly insensitive. Bombs typically were loaded with trinitroanisol (methyl picrate), another aromatic explosive similar to TNT, which the Japanese knew as Type 91 explosive. 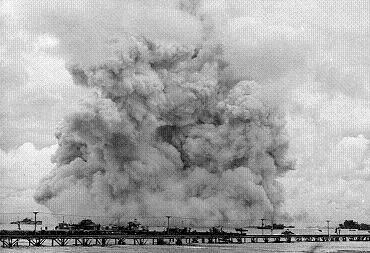 There were some quality control problems with Type 91 explosive, leading to low-order explosions that Allied personnel sometimes mistook for incendiaries. Some use was made of non-aromatic, non-alphatic explosives during the Pacific War. The Japanese used Type 88 explosive in a number of mines, which was a mixture of 66% ammonium perchlorate, 16% ferrosilicon, 12% wood pulp, and 6% mineral oil. The ferrosilicon was thought to improve the propagation of the detonation wave. Detonators for high explosives contained a small amount of a highly sensitive explosive, called a primary explosive, that could be triggered by impact or an electrical current. Primary explosives included lead azide, an inorganic compound of lead and nitrogen, and lead styphnate, a compound of lead with styphnic acid (a sensitive aromatic explosive related to TNT.) Mercury fulminate also saw use in detonators, while primers for small arms ammunition often used a mixture of potassium perchlorate and powdered aluminum. Detonators for insensitive explosives had to deliver a stronger shock than most primary explosives could provide. Two-stage detonators contained a small amount of a booster explosive that could be set off by the primary explosive and was powerful enough to set off the main charge. The Japanese made extensive use of powdered picric acid for booster charges, while the Allies preferred tetryl, which is chemically similar to ammonium picrate. PETN was also used as a booster. TNT is more sensitive as pressed crystals than as solid castings, and pressed TNT was used as a booster in some U.S. Navy munitions. As with propellants, the starting raw materials for high explosives manufacture included sulfur and large amounts of energy. However, while coal and timber could be used as raw materials, high explosives could be manufactured much more easily from petrochemicals, of which the most important was benzene. Thus explosives manufacture was yet another sector of the Japanese wartime economy that was constrained by Japan's oil shortage. However, even the Allied economies stretched their supplies of petrochemicals by combining aromatic explosives, such as TNT, with less expensive components, such as the ammonium nitrate in Amatol.